To Headquarters of 35 Bd. R.G.A. 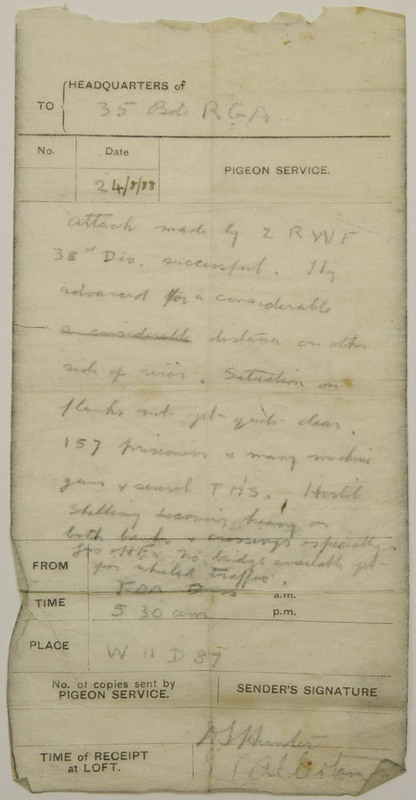 Attack made by 2 R.W.F. 35th Div. successful. They advanced for a considerable distance on other side of rise. Situation on flanks not yet quite clear. 157 prisoners & many machine guns & several TMS. Hostile shelling becoming heavy on both banks & crossings especially [?] H.E. No bridge available yet for wheeled traffic.